Strawberries are the most delicious and nutrition-rich red berries.Strawberries have red pulp with tiny yellow color seeds piercing through its surface from inside. Top end has small, green leafy cap and stem that is adorning its crown. Each berry features conical shape, weighs about 25 g and measures about 3 cm in diameter. They are also full of flavonoids. It has been proven that flavonoids decrease inflammatory process in the body and this helps to protect the heart. They are known to help reduce cholesterol from clogging up the heart's arteries.The potassium in Strawberries regulates blood pressure and prevent from arterial hypertension. Phenolic compounds present in strawberries are responsible for the fruit’s colour, taste and smell. Once such Phenolic compounds Flavonoids are known to be high in antioxidants. They have been proved to lower the risk of cardiovascular disease by inhibiting the oxidation of low density lipo-protein (LDL). Recent scientific researches has proved that certain compounds in strawberries help a lot to reduce LDL (bad cholesterol). Strawberries are rich in vitamin C which is a powerful anti oxidant and help a lot to Boost NaturalImmune system to fight against various infectious diseases. Strawberries are high in potassium, and high-potassium diets have been shown to reduce bone loss by preserving calcium stores and preventing the breakdown of bone that comes with age. Strawberries contain a good amount of Manganese which also helps to keep the bones healthy. Strawberries are rich in Vitamin C and really good food for the eyes Health. As we age, we suffer from Cataracts which creates a cloud over the lens of the eyes but this can be avoided with regular intake of vitamin C. The eyes need vitamin C to protect themselves from the free radicals that come from the Sun rays (UV rays). Regular intake of Vitamin C helps to strengthen the Cornea and Retina of our eyes. The best way to prevent any eye problem is by adding a lot of fruits rich in vitamin C rather than just vitamin C supplements. Eating three or more servings of fruit like strawberries may lower the risk of age related macular degeneration(vision loss). Vitamin C has been proven to prevent cancer. A phyto-chemical named Ellagic Acid which is found in Strawberries has been proven to have anti-cancer properties and suppresses growth of cancer cells. Strawberries are rich in fibre, which keeps your digestive system healthy, regular bowel movements and prevent constipation. Recent Scientific researches has proved that the red coloring in strawberries contains anthocyanins, which stimulate the burning of unwanted stored fat cells. Strawberries also contain a compound called nitrate that has positive effects on blood flow and oxygen around the body. Nitrate prevent muscles from becoming too tired and keeps you more energetic during exercise. Strawberries help polish teeth and keep them white and shiny.They not only kill plaque causing bacteria but also work great to remove stains from teeth. Make a mixture of one mashed strawberry and half teaspoon of baking soda.Using a toothbrush, apply the mixture to your teeth and let it stay for 3-5 minutes. Then rinse and clean your teeth with a regular toothbrush to completely remove the mixture because strawberries are acidic and may damage tooth enamel if allowed to remain on the teeth too long. For best results brush your teeth with this mixture once per week. 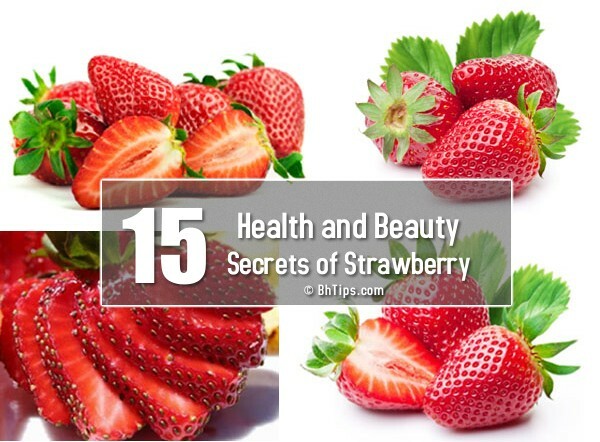 Being astringent in nature strawberries can reduce puffiness and circles beneath the eyes. For this purpose, cut a strawberry into thin slices. Lying in a cool place, put the strawberry slices under your eyes and relax for 10 - 15 minutes. Wash your face with cold water and gently moisturize it. Vitamin C, Alpha Hydroxy Acids (AHAs), salicylic acid and flavonoids in strawberries help in clearing acne and reducing oil. If you are suffering from acne, mash 2 strawberries and add 1 tablespoon of yogurt to the mash. Apply this mixture on your face and rinse after 10 to 15 minutes. For best results use this strawberry mask at least twice a week. Vitamin C in strawberries enables the body to grow and repair its tissues as it is involved in making collagen, an important protein needed by the skin and other parts of the body and helps heal wounds more quickly. Being water soluble, this vitamin cannot be stored in the body and has to be provided from food sources. A cup of strawberry provides 100% of Recommended Daily Allowance (RDA) of Vitamin C that plays a vital role in repairing skin damage. Strawberry juice has skin lightening properties. It is effective in removing age spots and freckles. You can squeeze the fruit to extract its juice and place it in a small cup and add some milk. Apply the mixture all over your face with a cotton ball and rinse off with lukewarm water after 10 - 15 minutes to get a fair glowing complexion. Strawberries are rich in antioxidants and are considered very effective to slow down aging process and prevent premature skin wrinkles.